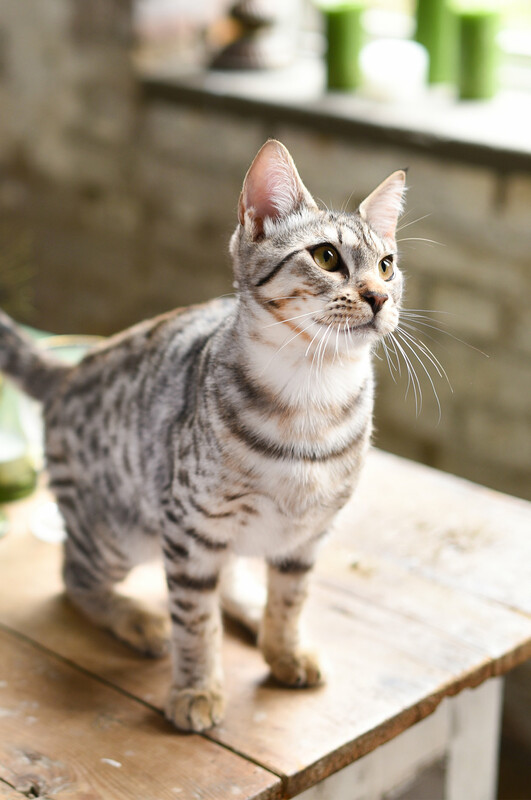 Find the best food for Savannah cats in no time with this run down of the most suitable, most delicious meals perfectly matched to the Savannah’s nutritional needs. Savannah cats are one of just a handful of modern domestic cat breeds that can trace their current breeding lineage all the way back to a genuine wild cat – in this case, the wild African Serval cat. This wild heritage makes the Savannah cat breed is one of the most visually striking and beautiful cats in existence. Interestingly, the Savannah is also known as the tallest breed of cat, standing on average 5 inches taller than other domestic cats! The Savannah cat is a very new breed of cat that got its start just a few decades ago in the 1980s and is still developing rapidly. So what kind of Savannah cat food should you feed this unique hybrid cat breed? 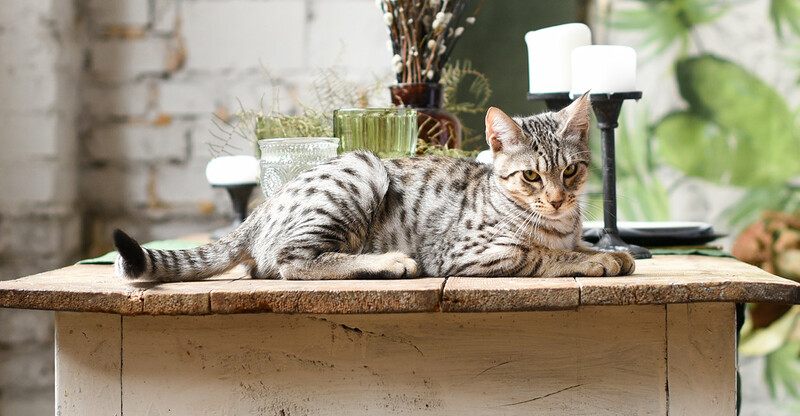 When you found your Savannah kitten, they were probably avertized alongside a filial number, such as F5 or F8. The filial number gives you a rough estimate of how much wild serval is still left in your purring Savannah. An F1 Savannah has a serval parent, an F2 Savannah has a serval grandparent, and an F3 Savannah has a Serval great-grandparent. You can read more about how this affects the proportion of serval DNA they have in our complete guide to the Savannah breed. But what does it mean as for feeding your Savannah cat? Well, the closer your Savannah cat is to its African Serval cat ancestor, the more like her wild cat parent she will be! Also, she will have a digestive system that is more specialized to digest only those foods a wild obligate carnivore (pure meat-eater) would normally consume. This means she may not be able to metabolize the nutrients in many cat foods as efficiently as her fully domestic brethren. In the wild, African Servals love to eat small rodents and birds. In captivity, you will need to take care in choosing the purest possible high protein foods that will suit the Savannah cat’s specialized digestive system. For this reason, breeders often recommend feeding at least a partially raw diet and steering clear of many (but not all) wet foods, which can include corn, gluten and other grains that are less easily digested. A high-quality grain-free, corn-free dry food (free fed). A high-quality protein-rich wet food (once per day). Cooked (kittens) or raw (adults) meat protein (once per day). If you are adopting a Savannah kitten, it is wisest to stay with the feeding schedule and food type offered by your breeder or shelter. Transitions should be done slowly and with great care to minimize stress. While there are many benefits of feeding your Savannah cat a raw meat protein diet, the most realistic option today is to choose high protein, high quality commercial cat foods. Wild cats will often eat 15 to 20 small meals throughout the day, since they have to hunt and catch their prey before they get a meal. The more closely you can replicate this feeding schedule, the better for your Savannah cat. Not only will eating 15 to 20 times per day be more stimulating and enriching for your cat, but it will also help her maintain a more stable metabolism and energy level. 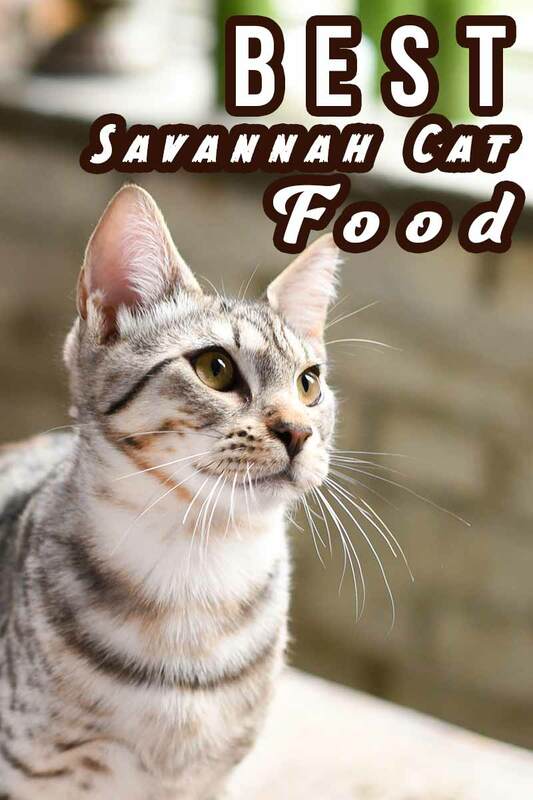 Now read on for a carefully curated selection of Savannah cat breeder-recommended dry food, wet food and kitten food for Savannah cats! Each of these specific adult cat dry foods is Savannah cat breeder-recommended! This grain free dry cat food comes in chicken or turkey flavor and is also free from corn, soy, potatoes, tapioca and artificial ingredients or preservatives. It has 83 percent protein and low-sugar vegetables like lentils. The special kibble helps reduce tooth tartar as your cat chews. This popular and highly rated dry cat food features deboned real chicken with plenty of nourishing antioxidant-rich foods like berries and cranberries. It is grain and gluten free with no meat by-products and is vitamin and mineral enriched. This popular and highly rated grain free, corn and soy-free, potato and by-product free dry cat food features freeze-dried raw ingredients made from predominantly real chicken. It is enriched with antioxidants, vitamins, minerals and essential fatty acids, as well as probiotics to support healthy digestion. This grain free dry cat food features venison and salmon, antioxidants, vitamins, minerals and essential fatty acids. It can be fed to kittens during weaning and into adulthood. Each of these wet cat food brands is a staple at Savannah catteries! This grain-free, whole chicken-based wet cat food is free from meat by-products, artificial ingredients and preservatives, including carrageenan, a seaweed-derived thickener which may have harmful gastrointestinal effects. This highly recommended and popular wet cat food is made from whole chicken with no animal by-products, no grain, no gluten and no corn or soy. This highly popular and well rated wet cat food is made in the U.S.A. with whole ingredients including chicken, rice and greens. It is also formulated to help control hairballs. This well balanced, nutritionally whole wet cat food has plenty of whole chicken plus amino acids, vitamins and minerals and essential fatty acids to keep your cat’s coat and skin healthy. You will notice some of these dry foods can be fed from kittenhood into adulthood, eliminating that transition stress! This popular kitten dry food contains a balanced blend of prebiotics, vitamins and minerals including vitamins C and E, lutein, taurine, which kittens need to develop strong, healthy immune systems. This specially formulated grain free, potato free dry food is suitable for both kittens and adult cats. It is 90 percent protein, so it closely mimics the food a wild cat would eat. Owners say their cats and kittens love this food and it is a great choice if you don’t want to have to transition your kitten to adult cat food. This well balanced dry food is suitable to feed to kittens and adult cats. It includes high-quality turkey and chicken in an 87 percent protein-rich recipe with added essential fatty acids, vitamins and minerals. This is another great food choice if you don’t want to transition your kitten to adult cat food. These breeder-recommended kitten wet food brands are endorsed by Savannah cat breeders! This popular and highly rated, breeder-recommended kitten wet food is prepared to be easy for small feline mouths to grab and chew. The first three ingredients are all whole meat protein sources and it is packed with essential vitamins and trace minerals for whole-body kitten development. This grain free kitten food is free from corn, wheat, soy, artificial ingredients and by-products. It is also fortified with vitamins and minerals. This carrageenan and grain-free kitten wet food is also free from by-products and artificial ingredients. It is enriched with vitamins and minerals and essential fatty acids. Deciding whether to include fresh raw protein in your Savannah cat’s diet is a very personal choice. The pros and cons, and how to go about doing it safely are a whole article in their own right. Luckily we have that article right here! So if you want to keep your Savannah cat’s diet as authentic as possible to her wild cat roots, do take a look. So there you have it – each one of these Savannah cat and kitten dry and wet food products has been recommended by an active Savannah cat breeder as a food they feed to their own kittens and cats! Are you caring for a Savannah cat? What does your Savannah eat? We’d love to hear what your cat’s favorite foods are – drop us a comment to let us know! Livingston, S., “The Nutrition and Natural History of the Serval and Caracal”, Veterinary Clinics: Exotic Animal Practice, 2009. Mills Tuck, M., “Savannah Cats,” F1 Hybrids Savannah Cattery, 2018. Sroufe, J., et al, “About Savannah Cats,” A1 Savannahs Cattery, 2018. Hummel, H., et al, “About Savannah Cats,” Select Exotics Cattery, 2018. Rockwell, J., “Savannah Cats: Diet,” Snow Canyon Savannahs Cattery, 2018. Morris, M., “Savannah Kittens FAQ,” IWannaSavannah Cattery, 2018. Tobacman, J. K., “Review of harmful gastrointestinal effects of carrageenan in animal experiments”, Environmental Health Perspectives, 2001.